With the release of his 10th novel, Wilmington writer Clyde Edgerton shows us that everything in life has a rhythm. It’s the rare author who shows up at a book signing with a mandolin, guitar, and four singing children. But it’s Clyde Edgerton’s way of turning a rote event into a toe-tapping, family-friendly happening. Edgerton is North Carolina’s most celebrated living fiction writer. He’s a pure product of the Old North State who captures the language, attitudes, and idiosyncratic folkways of its people in his often comical and deceptively casual narratives. It turns out that Edgerton is as unconventional and entertaining in person as his characters are on the page. Story continues below video. Enjoy scenes from Clyde Edgerton’s performance and reading at Southeastern Community College in Whiteville, N.C. Video produced exclusively for Our State magazine by Jonathan Weaver. For instance, his appearance at Quail Ridge Bookstore a few months ago to release his 10th novel, The Night Train, involved as much strumming and singing as it did reading. 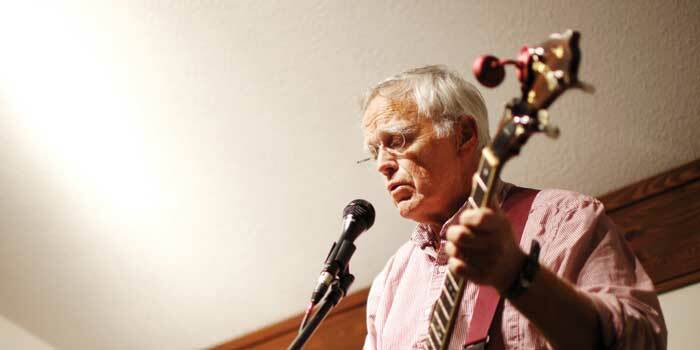 His 29-year-old daughter, Catherine — a singer/guitarist from Durham — joined him for a spirited handful of string-band tunes. Edgerton talked about syncopation and the rise of black music, illustrating his points with handpicked rhythm-and-blues tunes stored on his laptop. He held the laptop up to the mic, playing a mash up of snippets by James Brown and Igor Stravinsky to demonstrate the commonality. Because The Night Train is about that era when soul music — especially Brown’s groundbreaking album Live at the Apollo — helped bring together black and white youths, Edgerton’s performance style is simultaneously germane, instructional, and offbeat. He closed his presentation at Quail Ridge with another song, “Rank Strangers to Me,” a sepulchral gospel tune by the Stanley Brothers. Edgerton’s three young children — Nathaniel, 8; Ridley, 6; and Truma, 3 — chimed in on the chorus. Edgerton is a creative omnivore with an appetite for as much activity as he can fit on his plate. Fiction and nonfiction projects, songwriting, mandolin picking, college teaching, and child rearing all keep him occupied at the moment. He also prepared a musical adaptation of his novel Lunch at Piccadilly, which is in the early stages of production. He worked that up with Mike Craver, an early member of the Red Clay Ramblers. Edgerton and Craver belong to the Rank Strangers Band, an intermittently active quartet that plays old-time music. The two men also wrote and recorded a “reader’s theatre musical” (Edgerton’s term) of his novel The Bible Salesman, which they released on CD. Edgerton admits he doesn’t know what a reader’s theatre musical is, but it sounds about right. Edgerton also carries out his more circumscribed duties as a faculty member at the University of North Carolina at Wilmington, where he teaches creative writing and serves as a magnet for the school’s Master of Fine Arts writing program. On occasion, when he gets a free moment, he loads the family — his wife, Kristina, and their three young kids — onto his boat and heads out to an uninhabited island south of Wrightsville Beach to enjoy a day on the sand. The Night Train is Edgerton’s most musical novel and also one that overtly addresses the subject of race. In many ways, it’s his most autobiographical work of fiction. He draws most of the material from his high-school years, when he performed in a rock ’n’ roll band, and especially the year 1963, which marked a noncoincidental time of change in race relations and popular music. Edgerton’s personal experience growing up in the racially charged ’60s adds depth and authenticity to his writing. He remembers tough situations as a kid, like the time his dad told him to ask his black friend to leave their backyard. Edgerton retaliated by playing a secret, interracial game of hoops in the community gym. Much of what Edgerton saw and experienced during those times found its way into The Night Train, an even-tempered, good-hearted book about a couple of friends fumbling and forging their way through a difficult, transitional time with soul music as their soundtrack and guiding light. Parke Puterbaugh is a Greensboro-based writer who teaches at Guilford College. He is a former senior editor at Rolling Stone magazine and the author or coauthor of 10 books. See a review of Clyde Edgerton’s book The Night Train that appeared originally with this story.